PINK CHAMPAGNE is now more popular than ever before and it is no longer just the Champagne Geeks who are serving it both as an aperitif and with lots of different foods. Rosé Champagne has been around for centuries. Originally, it was made from all or mostly all black grapes – Pinot Noir and Pinot Meunier – and it picked up its very variable color from the skins of those grapes during the time the juice was in the press and perhaps for a few hours together with the skins in a tank. From a flavor standpoint, this may be the best way but this skin contact method of making rosé (called rapid cuvaison) has fallen from favor. It is too hard to control the color to get a consistent result in color, aromatics, or flavor. Almost all Rosé Champagne is now made by blending a bit of red wine into a white Champagne base before the second (in the bottle) fermentation. This gives the winemaker much more control over the final flavor of the fizz as well as a more consistent and predictable color result. For a long time, Rosé Champagne was as out of favor as dry still rosé from the south of France, Spain, or Portugal. At the same time that still rosé has become popular again, Rosé Champagne has come roaring back. Pink Champagne now enjoys its largest market ever. While the initial attraction of Rosé Champagne may be the festive color, the avid consumer quickly realizes that the extra richness and earthiness (not to mention the vinosity or wine-like character) imparted by the addition of red wine make pink fizz work better at the table with a wider range of foods. Many aficionados feel that Rosé Champagne is THE food Champagne. For more on understanding the technical aspects of why your Champagne tastes like it does, please see Understanding What’s in Your Champagne Glass. Brut Rosé with Tech Notes and Scores. The Estate-Bottled (Grower) Rosés include a full tasting note as well. An ESTATE BOTTLED cuvee of 92% Pinot Noir made as white Champagne blended with 8% Bouzy Rouge (the famous but rare red wine from the grand cru village of Bouzy). Ferment in stainless steel tanks but with a full malo-lactic fermentation and aged 4 years on the yeast before a dosage of 6 grams per liter. Decidedly pink (as opposed to orangey-salmon) in color and fully sparkling. dry and fresh with light but present phenolics (from the red wine component). Supple and juicy with red fruit accented with subtle earth. It hints at exotic spice with fine perfume and a balancing core of citrus and red fruit acidity. Its toastiness emerges in the mouth. Great feel. Yum. Excellent. BearScore: 94. 85% Grand Cru Chardonnay from the Cote du Blanc villages of Avize, Cramant, Mesnil-Sur-Oger, Oger and Vertus with 15% still red Pinot Noir from Montagne de Reims. 40% Reserve Wine. Aged at least 3 years on its yeasts. BS: 95. 50% Chardonnay, 30% Pinot Noir, and 20% Pinot Meunier from three vintages in the cuvee with 40% of reserve wines with a “a small amount of red wine to add a light color.” BS: 94+. 62% Pinot Noir, 24% Chardonnay, 14% Pinot Meunier with only 6% red wine added. 30% Reserve Wines. Aged at least 3 years on its yeasts. Dosed to 7 grams per liter. BS: 96+. An ESTATE BOTTLED cuvee of 60% Chardonnay and 40% Pinot Noir (Cramant (Grand Cru) and Fossoy) fermented in temperature controlled stainless steel tanks. The Pinot Noir component includes 12% Coteaux Champenois red wine). The cuvee is made up from several vintages with 15% of reserve base wine. Aged on the yeasts for a minimum of 36 months and dosed to 9 grams-per-liter. An unusual Rosé in that it tastes more of Chardonnay and citrus than of the red fruits you expect to dominate in Rosé. The red fruit notes are present more as essence of red fruit. The chalky minerality of Cramant is there and the yeast notes as well for a lighter more aperitif style of Rosé. BearSrore: 91+. An ESTATE BOTTLED cuvee of 60% Chardonnay (Bouzy Grand Cru), 40% Pinot Noir (Bouzy Grand Cru) from 40 year average age vines. Disgorged in Mar 2014 with 3 years on lees. Dosage 9g/L. Pale-salmon-pink color; dry, medium-full-bodied with freshly balanced acidity and scant phenolics. Richer rounder more focused Rosé with lots of red fruit balanced with a range of riper complex citrus. Has plenty of yeast and earthy minerality but the rich, integrated complete fruit here is the thing. This is great terroir talking without too much winemaking input. YUM. BearScore: 95+. 32% Chardonnay, 12% Pinot Noir, and 36% Pinot Meunier with 12.5% Red wine from both Pinot Noir and Pinot Meunier. 10% reserve wines. aged 5 years on it’s yeasts. BS: 92. 1/3 Pinot Noir, 1/3 Chardonnay, and 1/3 Pinot Meunier with 20% reserve wines consisting of 50% Chardonnay and 50% Pinot Noir with an additional 5% red wine from Les Riceys in the Aube. Aged at least 5 years on its yeasts. BS: 95+. Maybe the most vinous of all the Rosés listed here. An ESTATE BOTTLED cuvee of 50% Chardonnay, 50% Pinot Noir (30% of which is red Coteaux Champenois). 15% of the total cuvee is reserve wines. Full malo-lactic fermentation and and aged at least 24 months on the yeast. Dosed to 10 grams-per-liter of sugar) Orange-salmon in color and fully sparkling; dry, medium-bodied with fresh acidity and very light phenolics. Clean and fresh with red (strawberry and raspberry) fruit and citrus over limestone mineral and notes of toast and spice. Rich enough to drink with dinner. BearScore: 93. 80% Grand Cru Chardonnay from Mesnil-sur-Oger and 20% Grand Cru Pinot Noir (Bouzy, Ambonnay, and Tours-sur-Marne) with skin contact cofermented and aged at least three years on its yeasts. BS: 94+. 80% Pinot Noir, 20% Chardonnay. Part saignee and part red wine addition. BS: 92. 80 Pinot Noir with Skin Contact, 10% white Pinot Noir, and 10% Chardonnay. Dosed to 9 grams per liter. BS: 92. An ESTATE BOTTLED cuvee of all Grand Cru (Ambonnay, Verzeneay, and Bouzy) 70% Pinot Noir with 30% Chardonnay (40 year average vine age) blended with some of Egly Ouriet’s excellent still red Ambonnay Rouge for color. Fermented and aged in a mix of Burgundy barrels and stainless steel tanks. Aged 3 years on the yeasts and does to less than 2 grams per liter. Quite vinous with some red wine character to go with its Champagne focus and minerality. Layers of technique and terroir ad to the richness of the fruit. Hints at exotic and spice. Great food Champagne. BearScore: 94+. 50% Chardonnay, 50% Pinot Noir with 25% reserve wines. A portion of the Pinot Noir is red wine. Aged 30 months on the yeasts. Dosed at less than 10 grams per liter. BS: 94. An ESTATE BOTTLED cuvee of 90% Chardonnay with 10% Pinot Noir Champagne Rosé. The color comes from the red grapes/juice getting a 6-7 day maceration (with no alcoholic fermentation) before being blended and co-fermented with Chardonnay and 8 months of vat aging before bottling. This bottling is based on 2010 with 30% reserve wines added for depth and richness. Aged over 4 years on the yeasts before it was disgorged in October 2015. Dosage at 8 grams/liter. Pale-salmon-orange in color; dry, medium-bodied with fresh acidity and scant phenolics. Integrated complete style of Rosé with enough red fruit and lots of Chardonnay (citrus and focus) character. the fruit, mineral earth, and yeastiness all knit together. More elegant aperitif style of Rosé. BearScore: 92+. An ESTATE BOTTLED cuvee of 100% Pinot Noir (all from Bouzy) cuvee from 15-30 year old vines farmed according to lutte raisonée principles. Grapes are macerated briefly for color then pressed (which is the original but now very rare way of making Rosé Champagne) and fermented suing indigenous yeasts in stainless steel tanks. Aged for three years on the yeasts and dosed to 6 grams per liter. Pale-salmon in color; dry, medium full-bodied with fresh acidity and light phenolics. Supple and riper but still fresh. Lovely red fruit with a hint of citrus and a sort of earthy minerality. Has a sort of red wine sensibility. Fine Food Fizz. Delicious. BearScore: 92. An ESTATE BOTTLED cuvee of 100% Pinot Noir (from a a single site called La Cote aux Lièvres) Rosé that is fermented in small stainless steel tanks with 12 to 24 hours of skin contact and allowed a full malo-lactic fermentation. Given three years on the yeasts and dosed to 8 grams-per-liter. Offers more color (a vivid pink-red) and depth than most Rosé Champagne with lots of almost sweet tred fruit and just enough citrus to go with some mineral earth and toasty richness. Excellent food Champagne for drinking all the way through a meal. BearScore: 94. 100% Pinot Noir from mostly Grand Cru plots farmed expressly for Rosé production. The grapes are crushed and macerated for over 2 days before being pressed into fermentation tanks. Aged for 4 years on its yeasts. BS: 94. 80% Pinot Noir and 20% Chardonnay all from Grand Cru Vineyards in Verzy. The rose color comes from aa 20+ hour skin contact after the Pinot Noir is crushed (whicxch is the old way to make Rosé Champagne but fails rare now). Aged at least 3 years on its yeasts. BS: 92+. An unusual ESTATE BOTTLED cuvee of 90% Chardonnay and 10% Pinot Noir (all which is red wine). Vinifcation and aging for 8 months in stainless steel with no malolactic fermentation. Aged 4 years en tirage (on the yeasts). Finished true Brut with a 7g/l dosage (0.7%). 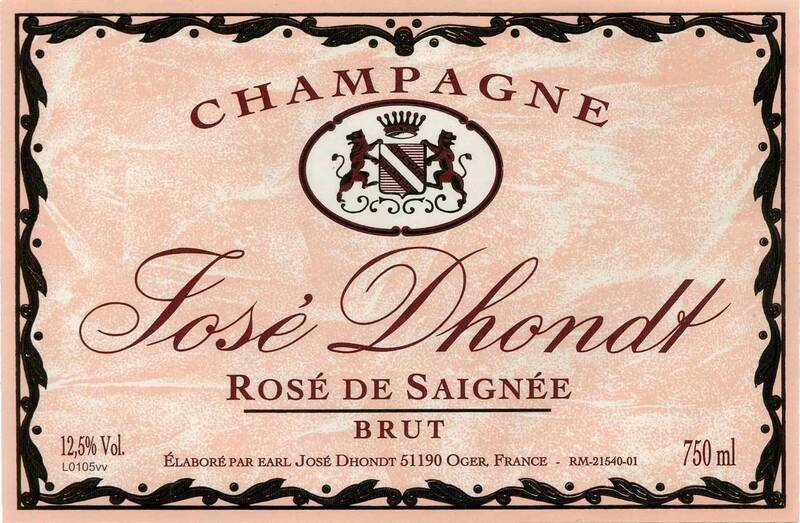 Deep salmon-pink color and fully sparkling; dry, medium-light-bodied with fresh acidity and scant phenolics. Riper darker rosé with lots of red fruit. The 10% red wine in the blend gives it a strong red fruit character but the 90% Chardonnay keeps it elegant (with a citrus balance) and keeps it from any heaviness. It is toasty-yeasty and mineral but the driving force is the tension between the red fruit character and its Chardonnay elegance. Ultimate food Champagne. BearScore: 92+. 40% – 50% Pinot Noir (10% red wine), 30% – 40% Pinot Meunier (10% red wine), and 10% – 20% Chardonnay aged on its yeasts for 21 months. Dosage at 9 grams per liter. BS: 90. 10% Chardonnay, 60% Pinot Noir, 30% Pinot Meunier with 25% reserve wines. 18% of the Pinot Noir and Pinot Meunier is red wine. Aged 3 years on its yeasts. BS: 92. 50% Pinot Noir, 30% Chardonnay, 20 Pinot Meunier with 15% red wine added. Aged 3 years on its yeasts. BS: 90. 50% Pinot Noir (some of which is red wine), 25% Pinot Meunier, 25% Chardonnay with up to 20% reserve wines. Full malolactic fermentation. Aged for at least 3 years on its yeasts. Dosage to 10 grams per liter. BS: 93. 55% Pinot Noir (20% used as a red wine), 30% Pinot Meunier, 15% Chardonnay, 10-20% Reserve Wines. Aged at least 30 months. BS: 92. 50%Pinot Noir, 30% Chardonnay, 20% Pinot Meunier (15% of the blend is red wine). Aged 3 years on its yeasts. BS: 90+. 50 to 55% Pinot Noir, 15 to 20% Pinot Meunier, 28 to 33% Chardonnay with 25-35% reserve wines. 12% red wine added for color. BS: 92.